The Yosemite Valley to Cloud’s Rest backpacking route gives you the best of Yosemite Valley – hiking to the top of the north rim and Yosemite Falls and back to the valley via John Muir Trail. 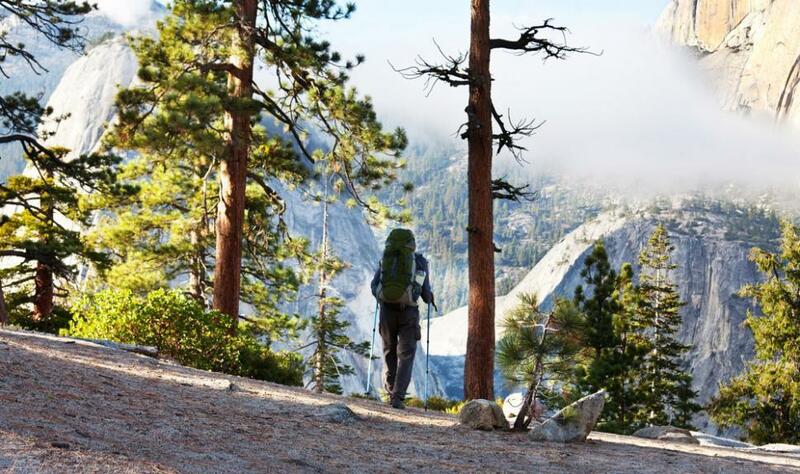 You will hike up the tallest waterfall in the park, as well as the lower 48 states, camp by an alpine lake (Tenaya Lake) and hike over a point 1,000 ft higher than Half Dome for better views and fewer people (aka tourists taking selfies). We will finish the hike with the masses of day hikers – and maybe a segway – but the majority of your time spend in Yosemite will be just you, the mountains and a black bear or two. The Yosemite Falls to Cloud’s Rest hike is the perfect trip for anyone looking for a challenge (beware; this is the mother of all Stairmaster workouts times two), and for those already visiting the Valley but want to experience something not on @mroutdoors Pinterest profile. A 6 day trip is also available covering the same route but with the possibility of an ascent up Half Dome so you too can have a selfie to post on Facebook – pending permit availability. From Yosemite Valley we ascend the tallest waterfall in the lower 48 states. The views, and the climb, all the way to the top are breathtaking and challenging! After about 5 miles (8 km) of hiking, and a 3,200-foot (975 m) gain in elevation, we reach our campsite just past Yosemite Point. Once at camp, kick your feet up and enjoy the views without a pack on your back! Today we continue our journey toward Indian Rock and North Dome. For the overachievers, we have the option take a couple side hikes in order to ascend the 8,522-foot (2,597 m) Indian Rock and the 7,542-foot (2,298 m) North Dome. From North Dome, we will have outstanding views of Clouds Rest. Our goal is to camp along Snow Creek and relax by another warm fire, at an elevation of about 7,000 feet (2,134 m). Today’s hike is about 8 miles (12.9 km). Get your swimmies ready – we’re heading to Tenaya Lake! But first, we have a 7.6 mile (12.2 km) hike with a 1,100 ft (335 m) increase in elevation to accomplish! The scenery, like everywhere in Yosemite, is amazing so you’ll never notice the heavy breathing. About 6 miles into the hike, we reach Olmstead Point so you can see what is waiting for you tomorrow! The alpine lake has a great beach to relax on and catch some rays. Get your legs on! We hike about 10 miles (16 km) today and ascend 2,000 ft (610 m) up and over Cloud’s Rest. The overall milage can vary today depending on how much hiking you want on the last day. At 1,000 ft higher than Half Dome, the views are so much better and worth the climb – plus no cables to hang on to or back of heads to stare at. From the top, you even get a view of Half Dome. How cool is that! We will camp near Sunrise Creek for the night. After breakfast, we pack up and return to Yosemite Valley via the Mist Trail – passing both Nevada and Vernal Falls (plus a lot of other hikers) or John Muir Trail for a bird’s eye view of Nevada Falls and Liberty Cap. The total distance is approximately 4.7 miles (7.6km). We are typically back in the Valley by lunch time.